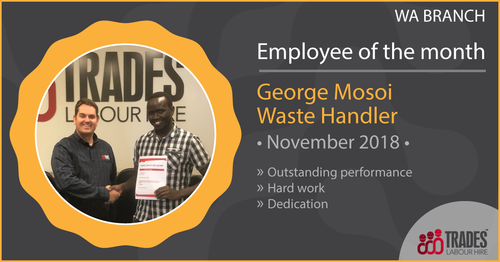 Congratulations to George Mosoi for being our November 2018 employee of the month! Another month went by and Trades Labour hire has been busy nominating their employee of the month for 2018. Every month, our Safety Officer, Justin Braddon, receives Australia wide nominations from all our branches. Each nomination is then entered in a software which randomly picks one employee. This month, we are pleased to announce that George Mosoi from WA is our employee of the month! George is pleased to have been awarded employee of the month. “Thank you for offering the employee of the month award. 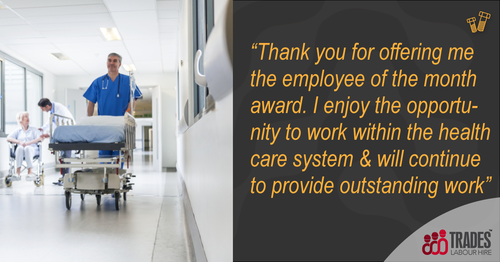 I enjoy the opportunity to work within the health care system and will continue to provide outstanding work”.